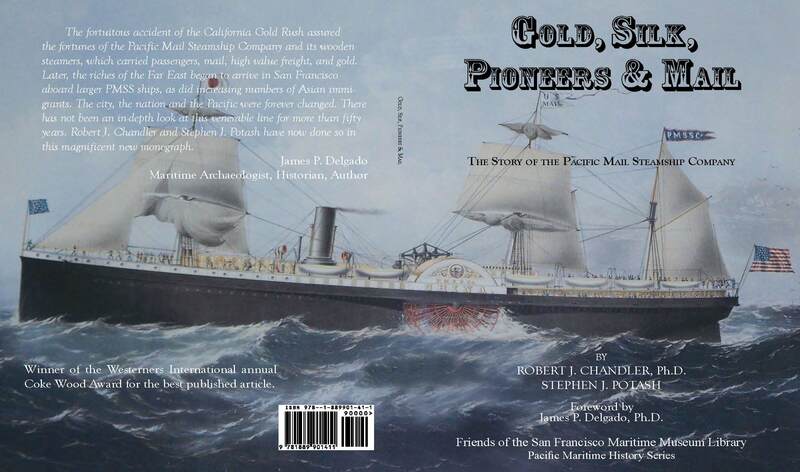 Co-authors Robert J. Chandler, Senior Research Historian at Wells Fargo Bank, and Steve Potash of Potash & Company, have launched the first book in more than 50 years to focus on the glorious contributions of Pacific Mail Steamship Company, which served San Francisco from 1848 through the first quarter of the 20th Century. The year 2008 is the 160th anniversary of the founding of this incomparable steamship line. Titled "Gold, Silk, Pioneers & Mail," the richly illustrated book tells how the wooden side-wheel steamers of Pacific Mail -- a predecessor of APL -- transported miners to San Francisco for the California Gold Rush (and carried their gold dust back to New York). Later, in 1867, Pacific Mail inaugurated the world's first regular trans-Pacific steamship service, sailing from San Francisco to Japan and China, and bringing back riches from the Orient and waves of new immigrants. Thus the line contributed not only to the development of San Francisco and of California and the West Coast, but also to the advent of today's vast Pacific Basin commerce. The book features a foreword by James P. Delgado, the West Coast's leading maritime archaeologist, historian and author, who has personally dived some of the fabled Pacific Mail wrecks. It is illustrated with the ephemera collection of Dr. Chandler, and the original Pacific Mail paintings, lithographs and other artifacts of the Potash collection. Published in a limited edition of 500 numbered copies in 2007 by the Friends of the San Francisco Maritime Library. For more information, contact the Friends of the San Francisco Maritime Library or Glencannon Press, Palo Alto CA. Comments may be sent to the authors directly.